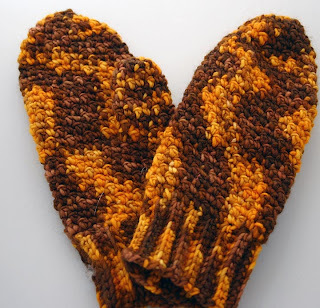 Just finished these mitts and posted the pattern on Ravelry (here) as a free download. (Not on Ravelry? Click download now to download the pattern as a PDF file.) 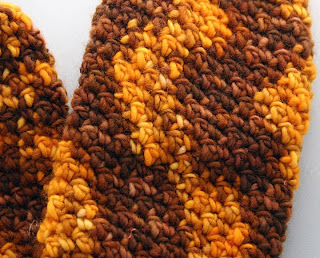 I spotted the yarn - gorgeous Malabrigo worsted in 'Roanoke Gold' - during class last week and knew immediately that it wanted to be a pair of mittens. The companion skein is still in my stash, awaiting its turn to become a matching scarf. I wanted a pair of mitts with thumbs in the right place (you know what I mean - I hate fits-either-hand mittens); that had a pretty but easy to learn stitch pattern; a bit of shaping so they weren't boxy; and that wouldn't let the cold air in, as some simple single and double crochet stitches do. This cobblestone, high-low stitch and the instructions for a left- and right-side thumb fits the bill for me. The pattern is completely customizable and while a total beginner might struggle a little, anyone with a bit of experience should be able to breeze right through. Now if it would just snow in SoCal so I could wear these . . .